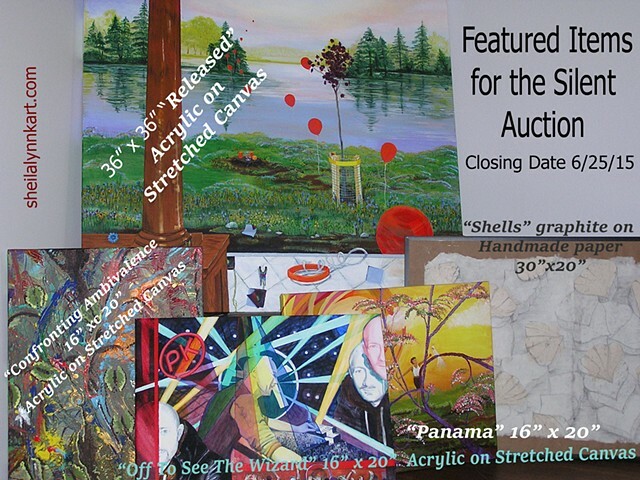 •	By Signing Up and Bidding in this SheilaLynnK Art Studio silent auction, each bidder agrees to the auction rules. •	List prices have been determined based upon cost of materials and number of hours required to complete the work. The studio reserves the right, without notice, to add or remove items from the auction. •	Payment for items purchased must be made at time of pick up on June 29th or 30th 2015. You may schedule your pick-up/payment appointment time when notified of your winning bid on 6/25/15. If we are unable to contact you, the item will be sold to the next-highest bidder. Any item left un-claimed by June 30th will be sold at a later date. •	Each person bidding assumes all risks and hazards related to the auction and items obtained at the auction. Each bidder agrees to hold harmless from any liability arising as a result of participation in this event from The Art For Arachnoiditis Project, SheilaLynnK Art Studio, Project Sponsors, and/or volunteers connected with Event, including but not limited to purchase pick-up after the event. Each item will be awarded to the highest bidder unless purchased directly at the top of the bid sheet. Highest bidder will be notified 6/25/15. Bids lower than the Direct Purchase amount are accepted until someone agrees to the Direct Purchase price. The first bidder to write his name beside the stated amount agrees to pay that amount and wins the item; no other bids are accepted after that point. If, however, no one agrees to the Direct Purchase amount, the person who has bid the highest wins the item. THIS IS A BINDING PURCHASE AGREEMENT FOR Merchandise FROM SheilaLynnK Art Studio, a for-profit business. ALL AUCTION ITEMS ARE SOLD AS IS. ALL SALES ARE FINAL. These funds will be distributed toward the artists’ stipend for charitable art projects from the studio. For fundraising purposes, the total amount raised during the silent auction will be deducted from the artist stipend portion of the project budgets. If you would prefer to make a direct tax-deductible contribution to the Art For Arachnoiditis Project via the New York Foundation for the Arts, you may do so per the project instructions posted inside the studio or HERE.